Guatemala City, August 2018. The Center for Climate Strategies (CCS) presented a draft macroeconomic indicators assessment of 43 Low Emissions Development Strategies (LEDS) policies designed to expand national economic growth and jobs through the USAID/Guatemala Low Emission Development Project. Policies in all sectors were developed through intensive screening and analysis over a two-year collaborative process involving over 300 stakeholders. Each LEDS action was designed to promote sustainable economic development while reducing greenhouse gas emissions, protecting forests and biodiversity, and enhancing energy security. The macroeconomic impact assessment covers Agriculture and Livestock, Forestry & Other Land Use, Waste Management, Transportation and Urban Land Use, Industry, and Energy sectors. It is based on the CCS Macroeconomic Indicators tool and, for each of the 43 actions, shows the potential influence of six policy design factors on Guatemala’s GDP and employment. 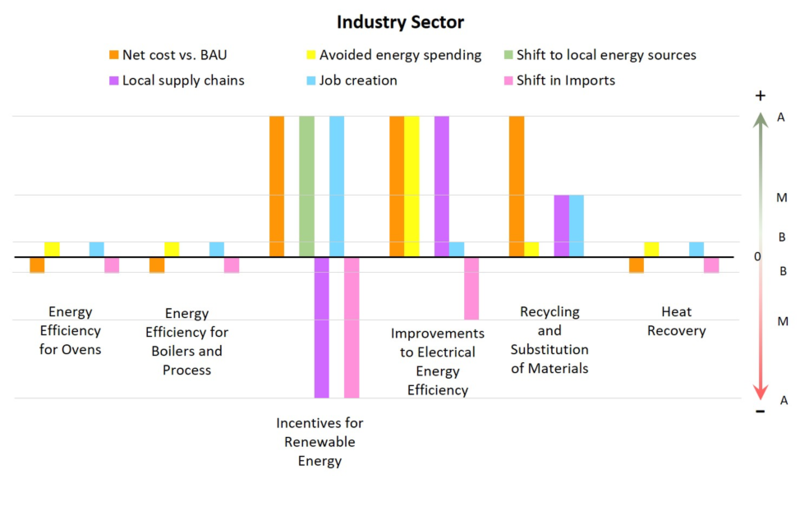 Factors include the relative cost of new actions versus status quo, avoided spending on energy, shifts to indigenous energy use, shifts to local supply chains, shifts to labor intensive activities, and use of investment from outside Guatemala. Macroeconomic indicators assessment of six LEDS industrial policies above shows the potential of each action to affect GDP and jobs based on financial impacts of implementation (spending and savings) and follow on macroeconomic effects. Guatemala LEDS stakeholders will provide review and comment on the results of the macroeconomic assessment of each of the policies before they are finalized for incorporation into the national LEDS Plan. CCS’ work on the Guatemala LEDS project began in 2015 with RTI International and has included facilitative and technical support. Previous deliverables include the Economic, Energy, Resources, and Emissions Baseline Report for the country and the microeconomic impacts analysis (GHG emission reductions, energy and resource shifts and cost-effectiveness) of 43 LEDS policies.